Ready for next-generation storage that delivers the power of metadata? A well-designed metadata environment gives you a whole new dimension for data management. It offers the flexibility to extend to a variety of cloud platforms based on the best combination of cost, performance, security and business needs. 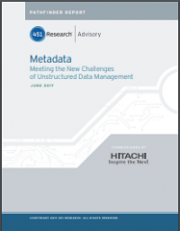 Understand the opportunities metadata offers to manage and harness the unbridled growth of unstructured data. Read the analyst white paper here.